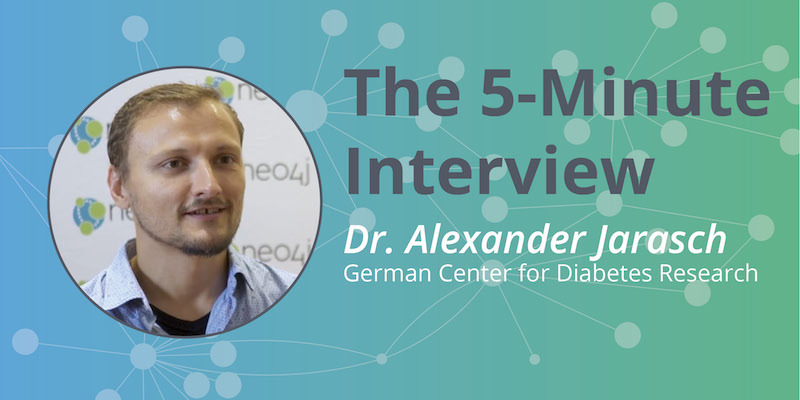 “When I saw Neo4j the first time, I was overwhelmed by how easy it is to connect different types of data,” said Dr. Alexander Jarasch, Head of Data and Knowledge Management at the German Center for Diabetes Research. Diabetes is one of the most prevalent diseases worldwide. The German Center for Diabetes Research (DZD) seeks to investigate the causes of the disease and, through new scientific findings, to develop effective prevention and treatment measures. This involves combining research data sources from genetics, epigenetics and metabolic pathways with data from clinical studies. 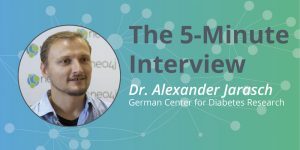 In this week’s five-minute interview (conducted at GraphConnect 2018 in NYC), we spoke with Dr. Alexander Jarasch about how DZD uses Neo4j to connect myriad sources of heterogeneous data into a knowledge graph. Dr. Alexander Jarasch: We use Neo4j as a knowledge graph to connect different types of data and different disciplines across locations, across species and across different research areas. Jarasch: A colleague of mine was using Neoj at a startup called Knowing Health, and they connected data from genes, proteins and transcripts. The first time I saw Neo4j, I was overwhelmed by how easy it is to connect different types of data and to curate the data. It made so much sense to me to use a graph database because our data sources are extremely heterogeneous. That’s why we chose Neo4j. What have been the most surprising results you have seen from Neo4j? Jarasch: For me, it was very surprising how quickly you can build a data model and how easily you can query it. Our researchers were impressed that the queries and the data model are so human readable. Users like it. If you could go back to when you first started using graphs, what would you change? Jarasch: I would take the time to learn more before diving in, especially about writing Cypher queries and about data import. What do you think is in store for the future of graphs? Jarasch: I think graph technology will be used more and more in research because everything in biology is inherently connected. That’s the reason why we are connecting more and more data sources about more and more diseases and exploring those connections.